Starz and Spotify, the leading music streaming service, announced plans to launch the first-ever streaming music integration into the STARZ premium video streaming service app. 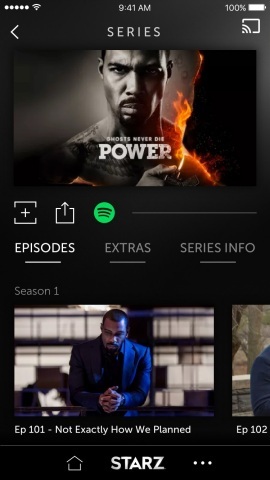 Starz launched an upgraded version of its free STARZ app that immerses the Spotify music experience into its premium video experience for STARZ Original series and other STARZ premium movie and television content. STARZ app subscribers will have access to a wide range of songs and soundtracks from hit TV shows including "Power" which features music from executive producer Curtis "50 Cent" Jackson, "Outlander" from Emmy ®-winning composer Bear McCreary ("The Walking Dead," "Battlestar Galactica") and movies from the largest premium pay TV movie library, including Star Wars: The Force Awakens, Annie and Disney's Inside Out. "Starz is thrilled to share plans to soon integrate Spotify's industry-leading streaming audio capabilities into the STARZ app," said Jeffrey Hirsch, Chief Operating Officer at Starz. "Spotify integration will complement and fortify the STARZ app's appeal for distributors and consumers alike. Boasting great premium content, download capabilities, and wide availability for free use by participating cable, satellite and telco providers and a low monthly price of just $8.99 for direct subscriptions, the STARZ app has burst onto the OTT landscape, quickly become a leading player in the space." For $8.99 per month with a 7-day free trial for new subscribers, fans now have the opportunity to enjoy instant access to more than 3,500 selections each month, including STARZ hit series ranging from "Outlander," "Power" and the upcoming "American Gods" and other TV content, to Hollywood hits and popular movies including Star Wars: The Force Awakens and Avengers: Age of Ultron. STARZ Originals in 2016 include "Outlander, "Power," "Black Sails," "The Girlfriend Experience," "Survivor's Remorse," "Blunt Talk," and "Ash vs Evil Dead," and the first STARZ Original movie, The Dresser. Exclusive hit movies on STARZ in 2016 include: Avengers: Age of Ultron, Star Wars: The Force Awakens, Inside Out, Pixels, Concussion, The Good Dinosaur, Ricki and the Flash, Paul Blart: Mall Cop 2, Cinderella, Tomorrowland, The Wedding Ringer and Ant-Man. Popular movie and television programming on the new STARZ ENCORE includes: The Equalizer, Pirates of the Caribbean: Dead Man's Chest, Signs, Never Been Kissed, Dances With Wolves, Gone Baby Gone, There's Something About Mary, Spider-Man 3, Out of Sight, Total Recall, Steel Magnolias, "Magnum, P.I.," "Diff'rent Strokes," "The Jeffersons," and "Gunsmoke." Starz (NASDAQ: STRZA, STRZB) is a leading integrated global media and entertainment company with operating units that provide premium subscription video programming on domestic U.S. pay television networks (Starz Networks) and global content distribution (Starz Distribution), www.starz.com. The Starz Networks operating unit is home to the flagship STARZ ® brand with 24.5 million subscribers in the United States as of September 30, 2016, with the STARZ ENCORE SM network at 31.5 million subscribers. Through STARZ, the company provides high quality, entertaining premium subscription video programming with 17 premium pay TV channels and associated on-demand and online services. STARZ is sold through U.S. multichannel video distributors, including cable operators, satellite television providers, telecommunications companies, and other online and digital platforms. Starz offers subscribers more than 5,000 distinct premium television episodes and feature films every year and up to 1,500 every month, including STARZ Original series, first-run movies and other popular movie and television programming. The Starz Distribution operating unit is home to the Anchor Bay Entertainment, Starz Digital, and Starz Worldwide Distribution divisions. In addition to STARZ Original series, Starz Distribution develops, produces and acquires movies, television and other entertainment content for worldwide home video, digital, and television licensing and sales. *source: Starz internal analysis of distinct movie title data for the period 7/1/2015-6/30/2016.